We all have been there, it's a late evening you have read a few blog posts and maybe even watched some YouTube videos about organisation, you are feeling totally inspired. You tell yourself you are going to have a productive, organised day tomorrow! Do you? NO! It's 12 o'clock and all you have done is stared into a screen for the last three hours. So I am here today to tell you how you can have a productive day tomorrow, and the day after and even the day after that. Okay, let's test you! * Groan* not that sort of test! Can you guess what the biggest distraction is that stops people having a productive day? Have you had a guess? That's right, the internet, social media, and mobile phones. I guarantee that 99% of you take your phones to bed! Don't! To train yourself to have a productive day you need to actually to get out of bed otherwise you spiral into ' I will just watch this video and then I will get on. Oh and another..." To do this, leave your phone downstairs the night before. This way you actually have to get out of bed. Instantly more productive! You having a productive day, you have crossed off a couple of things from your to-do list, you now want to put some music on. You decide to put on a song from YouTube. 15 minutes later you have clicked on a suggested video and now you are watching ' The what's in my mouth challenge' No no no! To stop yourself spiraling out of your productive day put music on that you can not change. For example the radio. I love to listen to vinyl because I can't change the song and run the risk of getting distracted. This way you won't get distracted and will enjoy getting your tasks done quicker. Following on from my last point, you need something to keep you motivated throughout your productive day otherwise you will just slump back into being lazy. A treat at the end, like your favourite meal or being able to sit back and enjoy a film or TV may spur you on but make sure you do your tasks properly because if you don't, it's not been a productive day. If you are a blogger, then joining in a few Twitter chats is definitely something I look forward to after a hard day of work! It's very rewarding meeting and talking to new bloggers and some familiar faces. Now that you are armed with all these tips hurry along and have a productive day! Thanks for reading guys, as always! Do you like having productive days? 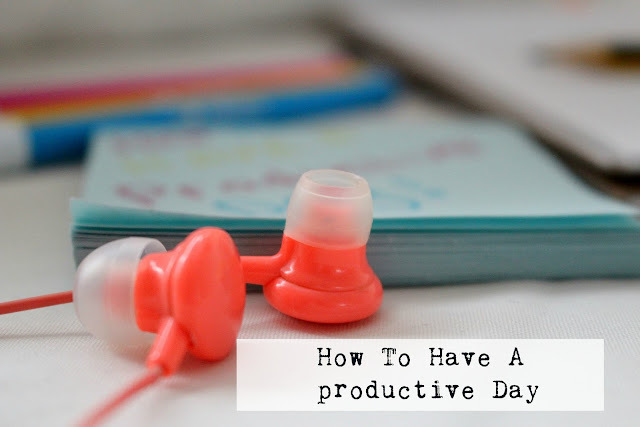 What do you do to make sure your day is productive? Great post! :) I feel like it's ok to have a lazy day every once in a while but after a very productive day I always feel so much better because I know that I got a lot of work done and actually used my time wisely. I was already motivated to have a productive day today but your post made me even more motivated so thank you for sharing. I love having productive days, it's so satisfying getting things done. I had a really good day today and managed to get everything I needed to do and more done! I'm loving these suggestions. I'm so bad about leaving my phone alone at bed time. I love making to do lists, it is a good feeking to cross things off. Watching movies on the internet in the comfort of your own home has a particular appeal. Please visit gomoviessc.org for more information.